For this project, the homeowners approached Swimmore Pools with a dream of completely transforming their small outdoor space. In a perfect display of its expertise in pool design and construction, the company built a 3m x 2.3m pool with striking visual appeal. Built to accommodate the homeowners’ young children, the concrete pool has a depth of 1.5m, which is perfect for them to jump into. The pool features two submerged benches that act as step entries, while the rear bench is fitted with four spa jets for relaxation. The sandy coping contrasts beautifully with the pool’s blue ceramic-tiled interior, which imbues the water with a welcoming hue. 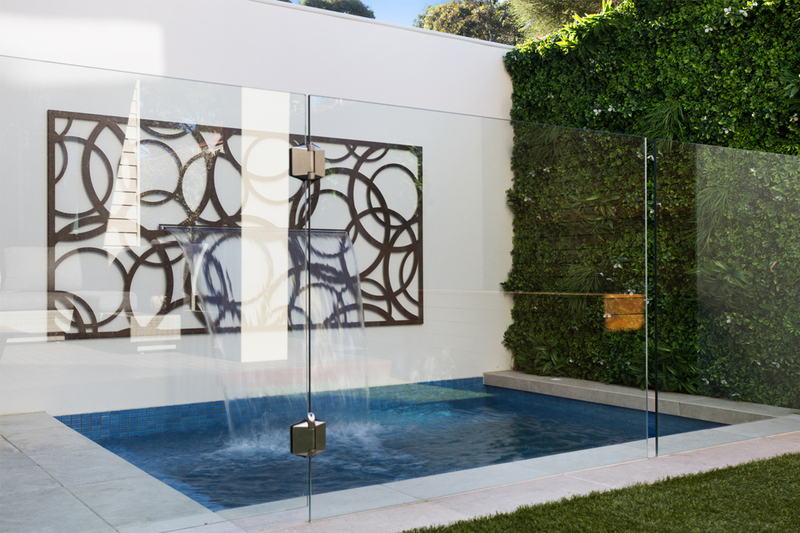 Positioned against the boundary fence, the pool can be admired from within the home. 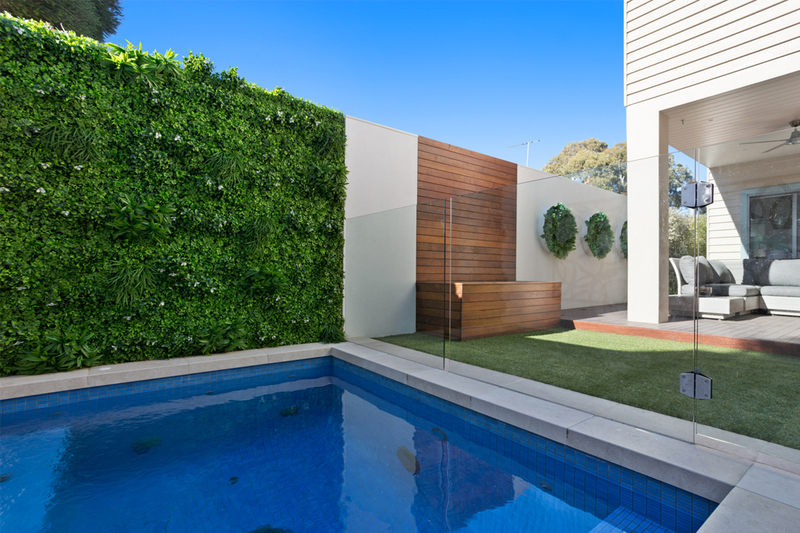 The border fencing is cleverly disguised with a 1200mm Silkflow Waterfall from AstralPool and a lush green wall. A PV3 automatic in-floor cleaning system from Paramount was installed to ensure the pool’s water remains pristine without the need for bulky cleaning equipment. Featuring a Quantum WN multicoloured LED light from Spa Electrics, a rigid-panel solar heater from Sunlover Heating and a back-up gas heater, the pool can be enjoyed at any time throughout the year. Fitted with an Therachlor SMC mineral chlorinator from Theralux, the pool provides a healthy and invigorating swimming experience. Swimmore Pools is a boutique company that specialises in the design and construction of fully tiled concrete pools and spas. Completing 20–30 projects annually, the company brings its expert services to clients throughout Victoria. Swimmore Pools was founded by Adam Moore, who brought with him decades of experience in the pool construction industry. The friendly team guides each client through the design process to ensure their new pool will stand the test of time. 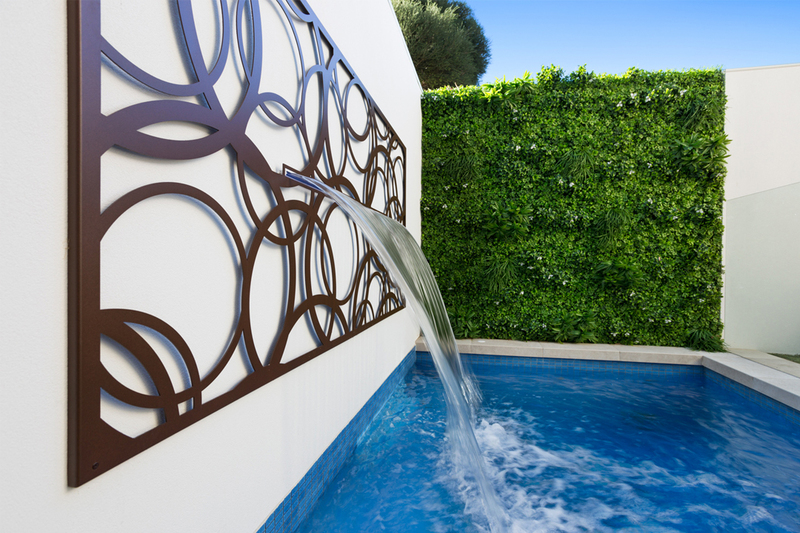 From basic plunge pools, to more technical styles, Swimmore Pools has you covered. With a dedicated team, the company can complete pool projects of all kinds and will exceed your expectations with ease. For more information, head over to the website and dive right in today!